Are you looking for the brightest flashlight? For this massive article we decided to organize the brightest flashlights by battery type and quantity. But, before we get started we need to cover the different ways that light output is measured for flashlights and decide on one of the measurements. 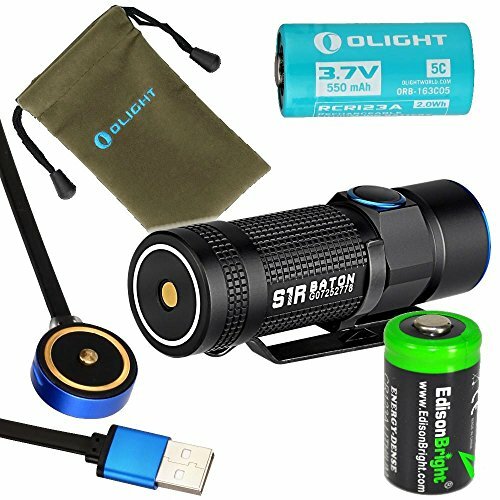 One more side note is that we try to provide both the brightest LED flashlight based on battery and a budget alternative that is particularly bright but at a better price point. 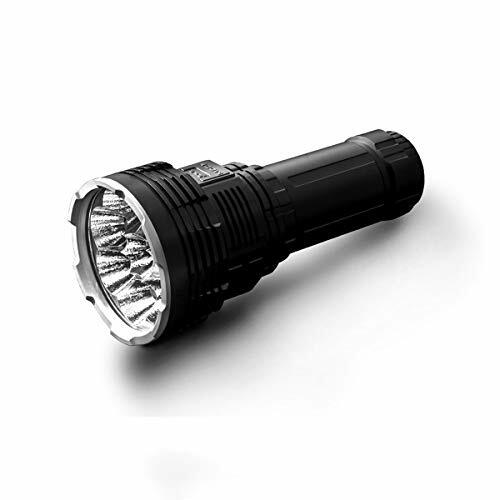 For this particular article that was not always possible since the most powerful flashlight was also in the lowest general price range and any of the considerably lower priced options were not bright for the category. The flashlight industry is quickly trying to standardize how flashlights are rated with the ANSI FL1 standards. In the FL1 standards there are 3 different ways that light output is measured. The three methods are Light Output which is measured in Lumens, Beam Distance which is measured in meters and measures the distance a beam will travel before it reaches 0.25 lux which is the brightness of the full moon on a clear night. Lastly is Peak Beam Intensity which is measured in candela and tells the brightest point of the beam. To determine the brightest flashlight we chose to use the overall Light Output measurement of Lumens. Both the Beam Distance and the Peak Beam Intensity can be greatly changed based on the angle and size of the reflector that is used. Lumens is a straightforward level of the overall light output. With that said the flashlight with the most Lumens will not necessarily be the flashlight that will shine the farthest. If you are specifically looking for a flashlight to shine a far distance check out our throw flashlight article. Remember that flashlights are tools and when you are looking for a flashlight you need to first consider what you want it to do. Some bright flashlights are too bright for some jobs. The last thing to consider when looking at a the Lumen number that a flashlight has is that FL1 standards measure the amount of light that comes out of the front of the flashlight not the theoretical max output of the LED emitter. Some of the not as reputable flashlight manufacturers will either completely lie about the amount of Lumens that their lights produce or they will state the maximum output of the LED emitter as listed by the LED manufacturer. For this guide we only use independently measured out the front Lumen measurements. There are a few different types of light sources that can be used in flashlights. Currently the most common lights are LED emitters. Most older lights were incandescent which means that there is a metal filament that heats up and produces light, most of these are not as bright as the current generation of super bright LED emitters and they are not as durable so we did not use any of these flashlights. The third type are HID lights which stands for High Intensity Discharge. These bulbs have gas trapped in a quartz capsule and when electricity passes through it the gas lights up. If you want more specific information about HID bulbs check here. The only reason we did not consider HID flashlights is because they are very expensive, the cheapest quality HID flashlights start around $300. With all that said this article is completely made up of LED flashlights. There are many reasons why you might want a flashlight that runs on AAA batteries. The main two are that the batteries are easy to find and that they are also very small. Most manufacturers do not recommend the use of 10440 batteries in AAA lights and in fact so actually say it is dangerous. A AAA Alkaline battery will run at 1.5 Volts while a 10440 Li-ion battery is 3.6 Volts. If your flashlight can handle the power of the 10440 battery it will have a significant boost in its Lumen output. Before you buy some 10440 batteries check out candle power forums to see what others have experienced with the same flashlight that you have. 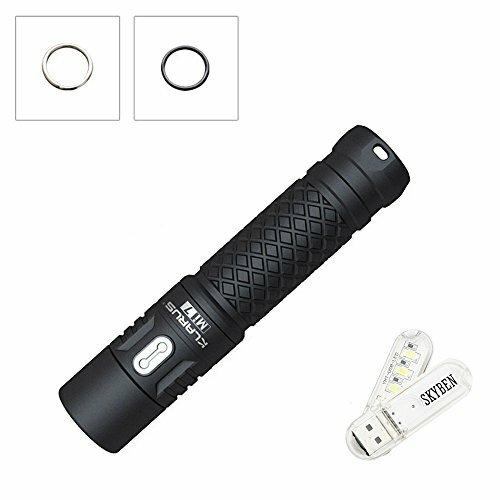 Since you are looking for the brightest flashlight you might also be interested in some batteries to go with that new flashlight. Here are our recommendations for AAA size batteries. First decide if you are going to go with rechargeable or non-rechargeable (primary) batteries. For rechargeable batteries in this size the best battery by far is the Eneloop AAA Ni-MH and as long as you are spending money on good batteries you should also have a good charger. For Ni-MH batteries we like the La Crosse BC-700. This charge is high quality, easy to use, and works with AA and AAA batteries. If get a cheaper charger the main thing is to make sure that it charges each battery independently and not in pairs. For primary (non-rechargeable) batteries the best are the Energizer L92 Lithium batteries, not to be confused with Li-ion these are not rechargeable. The L92’s are all around superior to standard alkaline batteries. 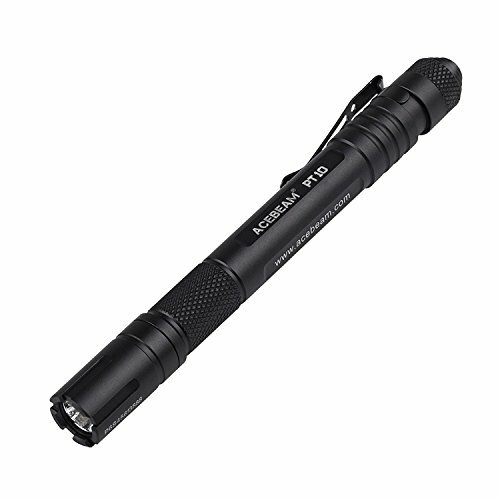 The Manker E02 is perhaps the smallest right angle flashlight in the industry. The light utilizes a CREE XPG3 LED to emit a maximum of 220 lumens of light. The light is powered by a single AAA battery and offers a maximum beam distance of 55m. The Manker E02 offers four main brightness levels, in addition to Strobe, SOS and Beacon modes. Turbo mode can emit a maximum of 220 lumens for a period of 3 minutes before automatically stepping down to 70 lumens for a period of 1 hour and 50 minutes. Controlled via a click switch located at the top of the “L” shaped light, the Manker E02 is different from other lights of similar size. The unique design provides a comfortable grip, while a magnetic tail cap and a reversible clip increase the versatility of the light. If you are looking for one with a headstrap you need to check out the Manker E02H. Lockout mode prevents the light from accidentally being turned on when stored. Engineering mode allows users to program “Moonlight” mode to their specific needs, can be programmed as low as 0.6 lumens. The SureFire Titan Plus is an improvement over the original SureFire Titan. The Surefire Titan Plus improves the convenience and functionality of the original SureFire Titan. 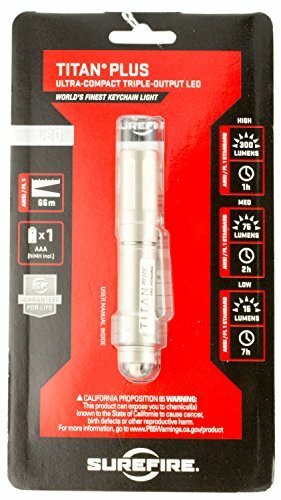 With the SureFire Titan Plus, users will get twice the maximum output with the lights ability to emit a maximum of 300 lumens. The ultra-compact light offers three brightness levels to choose from. The high-performance Led is paired with a specially-developed reflector to provide a perfect MaxVision Beam. The MaxVision Beam is a smooth and wide beam that is evenly dispersed making it ideal for close-range activities. Powering the light on and off or switching between brightness levels is done by twisting the head switch counterclockwise for low output or to activate the light. To switch to a higher output you must rotate the switch clockwise and then counterclockwise again within one second. 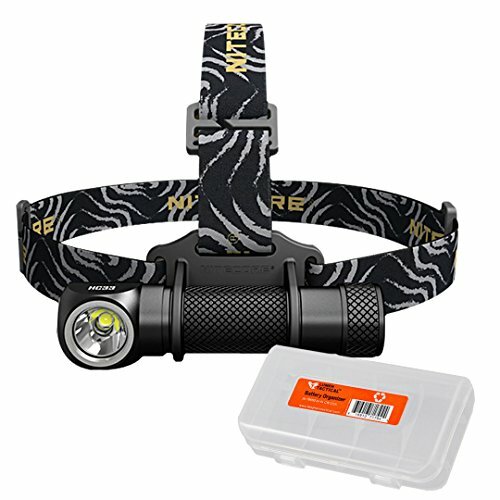 The virtually indestructible light offers a nickel-plated brass body with a heavy-duty removable pocket clip. The tail cap offers a key-ring attachment as a secondary carrying option. The SureFire Titan Plus is powered by a single AAA NiMH rechargeable battery, but can also be powered by a single disposable AAA alkaline battery. The Acebeam PT10 utilizes a high-density CREE XP-L HD W2 LED with a 50,000-hour lifespan. The high density LED allows the light to emit a maximum of 360 lumens with a peak beam intensity of 1046 candelas and a maximum beam distance of 65m. The Acebeam PT10 offers users three brightness levels: Low, Medium and High. There are no special or hidden modes found within this light. Powered by two AAA battery, either NiMh or alkaline, the Acebeam PT10 can run for a maximum of 10 hours at the lowest setting. Made from durable aircraft grade aluminum with a Premium type III hard-anodized anti-abrasive finish the Acebeam PT10 is impact resistant up to 3.93 feet. The high density LED is found behind a toughened ultra-clear glass lens that offers an anti-reflective coating. To provide an excellent beam with a decent throw the Acebeam PT10 features an orange peel reflector. To help protect the light from overheating the Acebeam PT10 features a copper base plate for efficient heat. 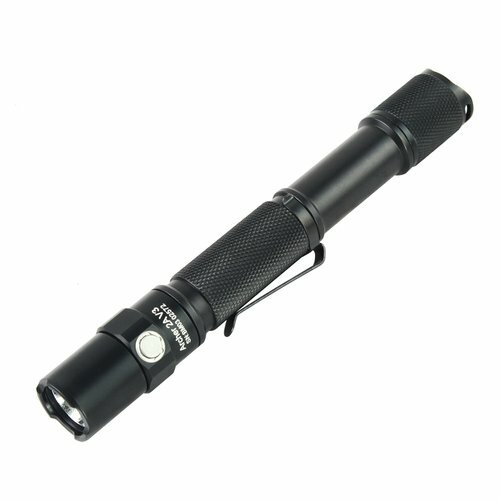 The lightweight and compact Acebeam PT10 offers an IPX-8 rating. In this battery size we still recommend using Ni-MH instead of 14500 Li-ion batteries since most manufacturers of these size lights do not equipment with the ability to handle the higher voltage. Again if you choose to put a 14500 battery in one of these lights please to research to see if others have had success. For the AA size batteries are recommendations are exactly the same as for the AAA batteries except in a different size. For rechargeable the Eneloop AA Ni-MH batteries are the best and we like to match that with the La Crosse BC-700 charger. And for primary batteries we like the Energizer L91 AA Lithium Batteries. The Klarus Mi7 also referred to as the Mini-Might Illumination AA Flashlight is small and lightweight making it ideal for an everyday carry light. The Klarus Mi7 features a CREE XP-L HI V3 LED that can emit a maximum of 330 lumens using a single AA battery. The Mi7 can also use Li-Ion 14500 batteries, which will increase the maximum lumen output to 700 lumens for 53 minutes. With the Klarus Mi7, users can expect a smooth and steady beam with no flicker as the light uses a constant current circuit rather than a PWM dimming circuit. The Klarus Mi7 is controlled via a click style side switch. The switch provides access to three main brightness levels, plus strobe and SOS mode. The side switch allows for one-touch access to both high and moonlight modes. A battery capacity indicator light is also controlled with the side switch. How much battery power is left will depend on how many times the light flashes. If using rechargeable batteries the over-discharge protection will automatically lower the output level as needed to protect the batteries. A lockout mode prevents accidental activation of the light and the IPX-8 rating makes it a suitable light for any condition. Using a CREE XP-L2 EasyWhite LED the Zebralight SC5w MKII offers a 3-step MacAdam ellipse tint deviation and a CRI of 83 to 85. The Zebralight SC5W MKII is powered by a single AA battery and can emit a maximum of 550 lumens for up to 3 minutes. Once three minutes has passed the Zebralight SC5w MKII automatically steps down to 407 lumens to prevent overheating. The CREE XP-L2 provides users with a neutral white beam with a 10-degree hot spot and an 80-degree spill. An aluminum unibody casing with a natural hard anodized finish makes this a durable light with an IPX-8 rating. With the Zebralight SC5w MKIIusers have the choice of three brightness levels, as well as beacon and strobe mode. Each of the three main brightness levels can be further programmed to two sub-levels. The second sub-level also has the ability to be further programmed to create more brightness levels. Users are alerted to current battery power levels via a battery indicator light. The light will automatically step down to lower brightness levels depending on the current battery power. A smart user interface offers a durable electronic soft-touch switch to provide almost instant access to all the various settings. The updated version of the Thrunite Archer 2A V2, the Thrunite Archers 2A V3 offers several improvements with the same amazing features. The updated version uses a cool white CREE XP-L V6 LED to emit a maximum of 500 lumens with a maximum beam distance of 161m. For those of you that don’t like the cool white beam, the exact same light is available with a neutral white light. The CREE XP-L V6 Led is paired with high-efficiency emitters to produce an excellent beam pattern with good overall visibility to allow the light to be used for various applications. The Thrunite Archer 2A V3 uses a two-button interface. The side button allows users to cycle through four brightness modes plus strobe. The tail switch powers the light and activates the momentary on mode. The Thrunite Archer 2A V3 offers mode memory so the light will turn on in the last mode used. Made from aerospace grade aluminum with a type III military-spec finish the Thrunite Archer 2A V3 is impact resistant up to 1m and offers an IPX-8 rating. The Armytek Partner A2 V3 uses two AA batteries to power a CREE XP-L White LED. Users can expect a maximum of 700 lumens with a peak beam intensity of 5080 candelas and a maximum beam distance of 143m. 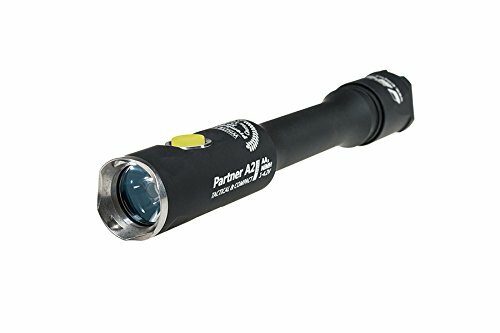 The Armytek Partner A2 V3 uses TIR-Optics to provide a smooth beam that doesn’t give off the tunnel vision effect after hours of use. For easy one-handed use, the Armytek Partner A2 V3 features an electronic side switch, as well as a tail cap switch. Constant brightness ensures the light output never flickers regardless of the mode being used. The light offers 6 brightness levels, two strobe modes, and a monetary on mode. Made from aircraft-grade aluminum with a premium type III hard anodized anti-abrasive finish the Armytek Partner A2 V3 offers the highest dust and waterproof rating available with an IP68. This allows the light to be submerged up to 10m for thirty minutes without suffering any damage. The Armytek Partner A2 V3 comes with a multi-color LED indicator light. The indicator light serves as a low battery indicator, as well as a temperature indicator. With the Armytek Partner A2, V3 batteries with a flat contact can be used without any problems. An over-discharge circuit is included to prevent damage to the light when using unprotected batteries. Moving into flashlights that are designed to run on a higher voltage these lights can handle both the lithium and Li-ion batteries and get a considerable boost in Lumens because of it. CR123A batteries are the standard camera battery size and they are about half the size of the 18650 Li-ion battery. Because of the sizes of these batteries most flashlights that take and even amount of the CR123A batteries can take 18650 batteries. When shopping for CR123A batteries stay clear of any of the manufacturers that have ‘fire’ in their name, these are usually cheap and poorly made. We generally try to stay with U.S. manufacturers since they have a more consistent quality. Our current favorites are the Streamlight CR123A batteries since they are made by a flashlight maker and they are U.S. made. For 18650 Li-ion batteries we stick with batteries built around the Panasonic cores. Our current favorite is the Orbtronic 3400 mAh protected top button batteries. You will also need a charger if you choose to go with Li-ion batteries, we like the Xtar VP2 Li-ion battery charger. The VP2 is a great charger at a good price and it also has a USB connection and use it as a battery pack. The Olight S1R Turbo S pairs a CREE XM-L2 LED with a TIR-optic lens to provide the best beam with a high transmission rate. The Olight S1R Turbo S looks just like all of the other Olight lights in the BATON series as it features an anti-roll design with a flat magnetic tailcap. The magnetic tailcap allows users a hands-free option as the light can be safely secured to various metal surfaces. The rechargeable Olight S1R Turbo S comes with an RCR123A battery that is able to be charged via the magnetic contact charging port with the magnetic charging cable that comes included with the light. The Olight S1R Turbo S can be powered by other batteries, including the CR123, only the RCR123A can be charged via the charging port. The Olight S1R Turbo S offers five different brightness levels ranging from as high as 900 lumens all the way down to 0.5 lumens. The light also features a strobe mode for emergencies. Every time the Olight S1R Turbo S is powered on the light comes on gradually so as not to blind the user from the sudden brightness changes. The light will also gradually increase or decrease as the brightness levels are changed to give the users eyes time to adjust to the different output levels. The Olight S1R Turbo S is operated through an easy to use side switch. 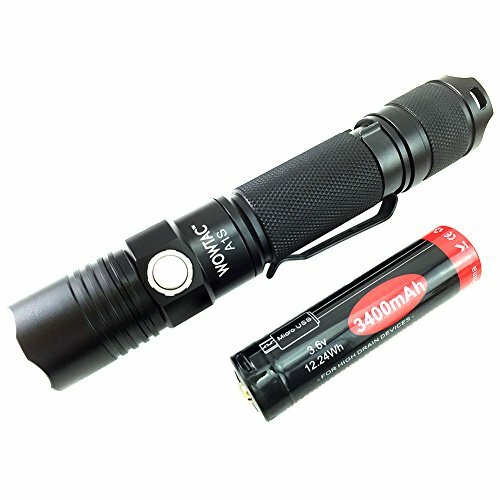 If you are looking for a compact 18650 light that won’t break the bank the Wowtac A1S is an excellent choice. The Wowtac A1S we are specifically talking about offers a cool white light, but there is also a neutral white light option. The Wowtac A1S utilizes a CREE XP-L V6 LED with a 20 plus year lifespan to emit a maximum of 1150 lumens. The CREE LED is paired with a smooth reflector located behind a toughened ultra-clear glass lens with an anti-reflective coating to provide a smooth beam with a peak beam intensity of 19,200 candelas with a maximum beam distance of 277m. The Wowtac A1S offers a dual-button user interface. The tactical trail cap powers the light, while the side switch allows users to cycle between the various modes. The Wowtac A1S offers four brightness levels, plus a strobe and SOS mode. This pocket-sized light offers an intelligent memory function so the light is always turned on in the last mode used and anti-slip knurling for a batter grip. A low voltage indicator will blink twice to alerts users to low battery power. The battery that comes included with the light must be taken out of the body of the light before recharging. The Zebralight SC600 MKIV features a CREE XHP50.2 Neutral White LED with a CRI count of 80 plus and a 3-step tint deviation. The Zebralight SC600 MKIV Plus uses a single 18650 battery to emit a maximum of 2300 lumens of neutral white light. The LED is paired with an orange peel textured reflector to provide a smooth beam with an 80-degree spill and a 14-degree hot spot. Its precision machined unibody casing is constructed from premium grade aluminum bar stocks with a hard anodized finish. Controlled via a durable electronic soft-touch switch the Zebralight SC600 MKIV Plus offers three main brightness levels, plus a beacon strobe mode. Like most Zebralights the 3 main levels of the SC600 MKIV Plus can be further programmed to offer more brightness levels. The Zebralight SC600 MKIV Plus offers a battery capacity indicator that will flash between 1 and 4 times based on remaining battery power. The light will automatically step down to lower levels to conserve the battery as it runs low. To prevent damage from overheating the three highest output levels feature PID Thermal Regulation Temperature Programming. The Emisar D4 is available in a variety of options, but it is still the lightest and most compact Quad LED powered by a single 18650 to hit the market. The light can be made even smaller by opting to use a 18350 or a 18500 battery for which the tubes can be purchased separately. 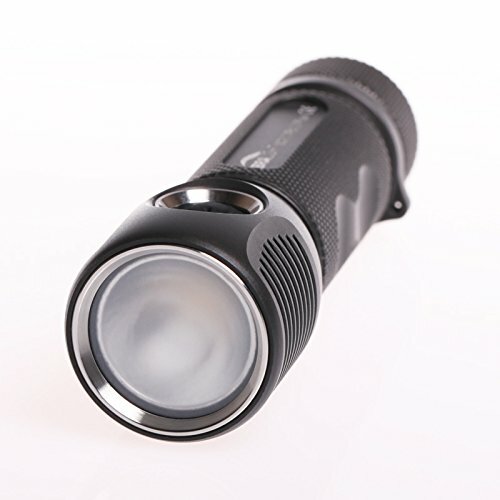 The Emisar A1S uses a quad XP-G2, XP-L HI or Nichia 219C LED for a very high output of lumens. Each of the LEDs is directly mounted on a copper direct thermal path MCPCB that offers thermal protection. The light is programmed to automatically step down if the internal temperature becomes too hot, users can program the temperature limit to their exact preferences. The LEDs are paired with a Careclo 10622 Spot Optics, which has a gate crop by design rest assured it is not a crack. The Emisar D4 is powered by an electronic side switch. The ramping user interface provides 150 ramp stamps between the lowest moonlight mode and the highest mode. Users can select anywhere from 0.6 lumens to 100 lumens. Ramping up the lumens is done by holding the side switch until the desired brightness is found. The side switch also provides users with access to the momentary on feature, lock out mode, beacon mode, and temperature and battery check by a series of fast clicks. The Emisar D4 has what we call mode memorization and will turn on in the last mode used. The Zebralight SC600f MKIV Plus uses a CREE XHP50 Cool White LED with a CRI of 70 and a maximum output of 1800 lumens. The Zebralight SC600f MK IV Plus pairs it Cool White Led with a frosted lens to provide a flood beam with a 90-degree beam spread. Powered by a single 18650 battery, which is not included with the light, the Zebralight SC600f MK IV Plus offers a smart user interface that is controlled via an electronic soft-touch switch. With the Zebralight SC600f MK IV Plus users have the choice of three main brightness levels, plus a strobe and beacon mode. The three main brightness levels can also be further programmed to provide more options. The highest brightness levels offer a programmable PID thermal regulated output to prevent damage from overheating. The Zebralight SC600f MK IV Plus offers a battery indicator light that will flash a specified number of times based on the current battery power level. To help conserve battery life the light automatically steps down to lower levels as the battery starts to run low. The Nitecore HC33 utilizes a high performing CREE XHP35 HD LED to emit a maximum of 1800 lumens. The high performance Led is paired with Precision Digital Optics Technology to provide a peak beam intensity of 8,750 candelas and a maximum beam distance of 187m. The Nitecore HC33 can be powered by a single 18650 battery or two CR123A batteries. Nitecore strongly recommends using the Nitecore NL1835HP 18650 battery for the best performance. In general, the 1865-0 battery will allow the Nitecore HC33 to perform better and run longer when compared to the CR123A batteries. Turbo mode, which is the brightness setting, is not available when using CR123A batteries to power the light. The Nitecore HC33 offers a unique L-shaped design. This design allows the light to be used as a handheld light when it is removed from its head strap. The light produces a flood style beam with a 100-degree angle. When used with the head strap the light can be adjusted 180 degrees. The magnetic tail cap and removable pocket clip allow the Nitecore HC33 to be hands-free. The light uses a single push button located on top of the head and is used to power the light and cycle through the various modes. With the Nitecore HC33 users have the choice of five main brightness levels, plus a SOS, strobe, and beacon mode. 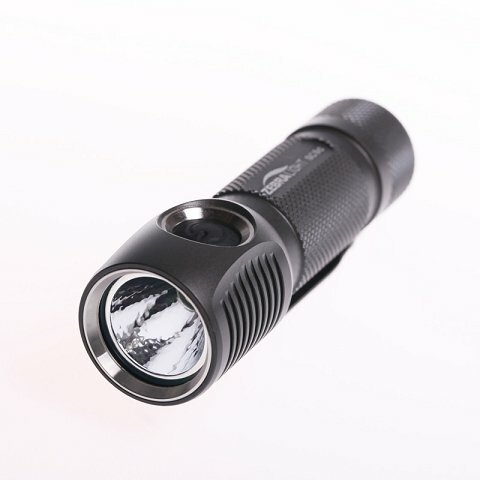 Powered by a single 18650 battery the Olight H2R uses a CREE XHP50 LED. With the ability to emit a maximum of 2300 lumens the Olight H2R is the brightest light in the industry powered by a single 18650 battery. The CREE XHP50 Led is paired with a TIR bead to produce a wide beam that is ideal for up close illumination. The Olight H2R offers a peak beam intensity of 5850 candelas with a maximum beam distance of 501 feet. In addition to five main brightness levels, the Olight H2R offers a Beacon/SOS mode for emergencies. When changing brightness levels the Olight H2R will do so gradually to help protect your eyes from sudden light changes. 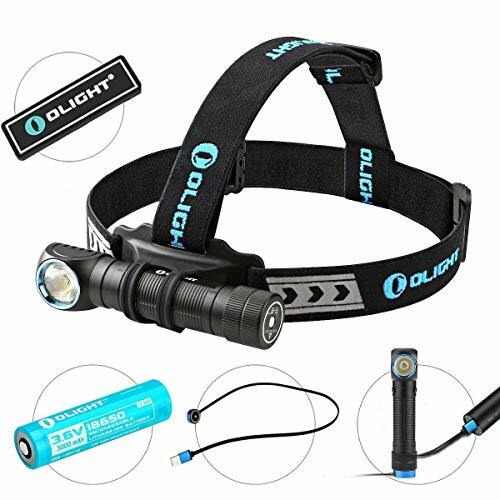 Users of the Olight H2R can use the light as a headlamp or a pack strap in addition to a pocket light as it is able to detach from the head strap mount and comes with a removable pocket clip. Operating the Olight H2R is done via a side switch that is slightly angled for a more natural operation. The Olight H2R is fully rechargeable via the magnetic tail cap and magnetic charging cable. Designed with law enforcement in mind the Olight R50 Seeker Pro is the redesigned version of the original Olight R50. The Olight R50 Seeker Pro belongs to the R Series of lights and is a heavy duty rechargeable light. The Olight R50 Seeker uses a magnetic USB recharging base to recharge the customized 26650 batteries inside the light. About the size of a soda can, the Olight R50 Seeker Pro is currently the most compact 26650 light on the market. A battery status indicator light glows red to indicate when the battery needs to be recharged. An indicator light on the cord glows red while charging and switches to green once charging is complete. The Olight R50 Seeker Pro uses a CREE XLAMP XHP70 LED that can emit a maximum of 3200 lumens of cool white light. The LED is paired with an orange peel reflector and a slightly concaved lens to provide a balanced beam with a maximum distance of 250m and a peak beam intensity of 15,600 candelas. The Olight R50 Seeker Pro uses a large industrial silicone side switch to operate the light. The side switch also acts as a lockout indicator and will glow red if the switch is hit while the light is powered off. The Olight R50 Seeker Pro offers 4 brightness levels and a built-in memory function to start the light in the last mode used. The Olight X7 Marauder features three CREE XHP70 LEDs that have the ability to emit a maximum of 9000 lumens in Turbo mode. The high performing LEDs are paired with a custom-designed orange peel reflector to produce the perfect beam for everyday use. With a peak beam intensity of 24,500 candelas, the Olight X7 Marauder has a maximum beam distance of 313m. The Olight X7 Marauder is powered by four 18650 batteries that offer a runtime of 6 hours and 30 minutes at 1000 lumens. The four rechargeable 18650 batteries can be recharged with an Olight C4 digit charger. The Olight X7 Marauder offers a user-friendly interface and an ergonomic design. The side switch located near the head of the light allows users to cycle through6 different brightness levels, including a Lower mode and a Turbo S mode. The Olight X7 Marauder uses Smart Thermal Management to protect the light from overheating. With Smart Thermal Management the light will automatically adjust the lumen output based on the internal temperature. This safety feature also extends the life of the light and the batteries. If you need a light to get rid of the darkness the Imalent DX80 is an excellent choice. They don’t call it “the End of Darkness” for nothing as it can emit up to 32,000 lumens on Turbo mode for a period of 3 minutes. The Imalent DX80 features an 8 piece CREE XHP70 2nd generation LEDs to provide a maximum throw of 806m with a peak beam intensity of 162,600 candelas. A multi-functional OLED display shows users the various parameters and settings. The Imalent DX80 offers a high efficiency constant current circuit to ensure constant brightness in all modes. The Imalent DX80 offers a side switch for easy one-handed control. The side switch allows users to cycle through six different output levels, plus strobe mode. Turbo mode can be accessed from any mode by double pressing the button. A built-in battery pack uses 8 high discharge performance 18650 Li-Ion batteries to power the light. The battery pack is able to be fully recharged in about 3 hours and 10 minutes using a standard 19V-2A charger. The battery symbol will flash 10 times per minute to warn users when battery levels fall below 13V. With how many lumens the light an emit overheating is a real concern. The Imalent DX80 uses intelligent temperature control to automatically adjust the current to keep the light’s internal temperature under 50 degrees Celsius. What Is the Brightest Flashlight? Through all of our research and reviews we have decided that the brightest LED flashlight by Lumens currently is the Imalent DX80 with a class dominating 32,000 Lumens. 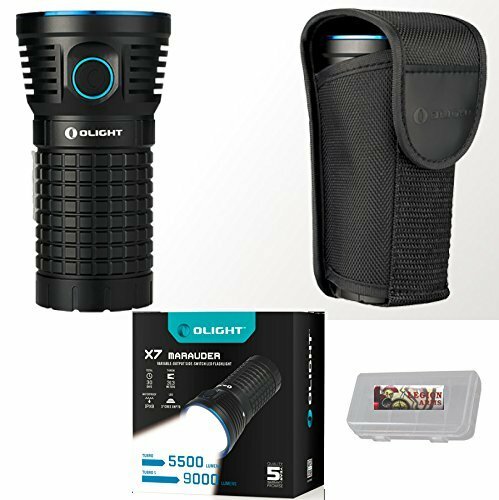 Just because the Imalent DX80 might be the brightest flashlight ever does not mean that it is the right flashlight for you. The first thing to consider is what you are going to be doing with the light and decide the size that you need. From there you should consider the types of batteries you are willing to work with. In most cases you will get a large jump in output from li-ion batteries as opposed to alkaline or Ni-MH. Please take these considerations into account before purchasing a flashlight, we want you to be happy with your purchase. Thank you for spending your time reading our brightest flashlight review article. We sincerely hope that you will be able to use this information while deciding which flashlight you want to buy. 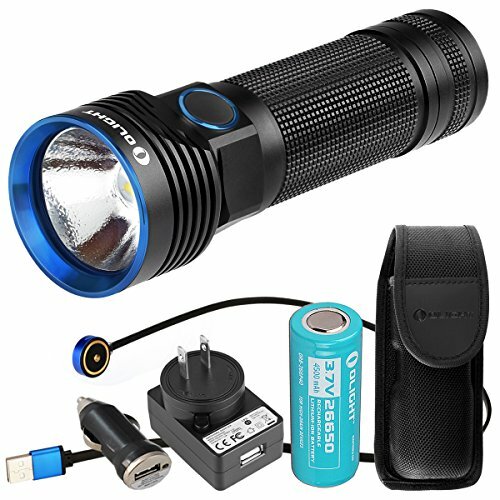 If you are looking for more information on our favorite flashlights check out our list of best of articles here. New to flashlights? Check out our Flashlight Buyers Guide. If we helped you please share this article and also click through one of our links to make your purchase. This site is part of the Amazon affiliate program and we are paid a small commission on each purchase that comes through our site with no extra cost to you. 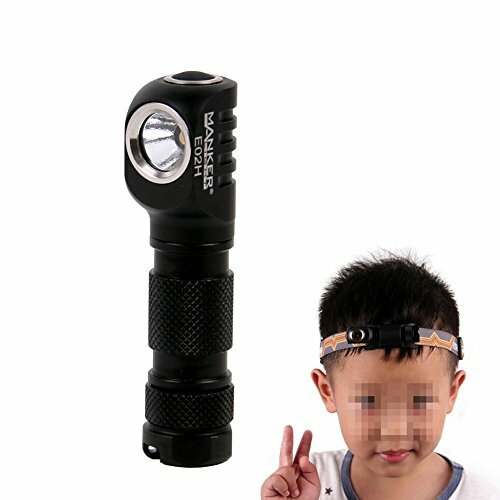 This is how we can continue to run this site and get flashlights for review.